CATASTROPHIC EVENTS soon to bring END OF THE WORLD! Listen. I know that there are very few of you now listening who do not have some serious trouble, sickness or worry in your family. Perhaps you think that no one else has the problems, the troubles, the hardships that seem to beset you. But whether you realize it or not these same discouraging troubles — financial troubles, sickness, family troubles — beset nearly every other family. Well, listen now to the Good News, every one of your problems and difficulties are going to be solved. You think you've heard the Gospel of Jesus Christ. But you probably haven't. Then you ask, "What has that got to do with your own discouragements, your troubles and sicknesses?" That very idea or that very suggestion — what has that got to do with it — simply proves that you haven't heard it. For the true Gospel of Jesus Christ has everything to do with it. Yes, with your personal problems and troubles and difficulties and also with the national and the world problems and difficulties, with world peace as well as with peace and prosperity and happiness in your own personal life and your family. Why must this world go on suffering? Only because it has lost the true Gospel — that is the sole and the only reason. Why is it that the churches then today have no solution for either your individual, your personal, your family or for national and world problems. I tell you my friends, when religious leaders took away the Law of God out of the Gospel, the gospel that they preached and when they changed the Gospel of Jesus Christ into their message about His person merely exalting Him, making a hero of Him, deifying Him which is good enough as far as it goes. And yet taking away His message, taking out the Law of God, the way to all of these things, the way into everything that everybody desires including eternal life, they took everything vital and everything worthwhile out of their message and they had left only an empty message that is leaving this world empty and hopeless, full of discouragement and frustrations and unhappiness that seems to beset almost every person and every family. Jesus Christ preached the Gospel of the Kingdom of God. Now, the word Gospel simply means Good News, Good News and good news of the future is prophetic. And Kingdom of God, the Kingdom of God is that divine Family which is the divine world Government that shall rule the World Tomorrow. But Jesus said that His Kingdom, the Kingdom of God, was not of this world, not of this time, this age. It is of the future of the World Tomorrow. And it is going to rule the world, both as to nations and individuals and families and bring us peace and happiness at last. The true Gospel which has not been preached for about eighteen hundred and fifty years is the way to peace and to prosperity and to abundant joyful living, the way to eternal life in that kind of happy condition forever and ever. Now, is that worthwhile? Why don't we have happiness now? Why do we have troubles? Why do we have all these worries and these fears? My friends, God Almighty set laws in motion at the Creation which were designed to give you peace and happiness and joy and everything worthwhile. Now, my friends this thing is an individual personal matter with you. I wonder if you're willing to wake up and to start to think about it and to get awake to the way that you can begin to solve condition now. Now, listen, God Almighty is going to solve these things for us if we're so stupid, so boneheaded, we might say, and so muly stubborn that we won't listen to Him or to His laws now, we're going to suffer. We're going to suffer a lot more. But eventually God Almighty, anyway, and that within our time and generation in just a few years now, is going to step in and supernaturally intervene and send Jesus Christ back to this earth, to rule all the nations of this earth as the King of kings and the Lord of lords. And to see that all government on this earth is the divine Government of God and that the individuals and the nations are forced to live, so far as the power of government over us is concerned, according to the ways of God, and He's going to solve our problems and our troubles in despite of us. But listen, you don't need to go through all the suffering that the world is going to suffer through between now and that time. You can put an end to all of these things right here and now. Do you know that it's possible my friends, if you can come to know the Truth, if you can get close enough to God and God's way, to know that every problem, every trial and test and everything that can possibly beset you, every discouragement, every fear and worry can be removed from your mind and you can come to have real peace of mind and know that everyone of your problems will be worked out right here and now. Now, I am not saying that there won't be any problems and perhaps you'll be beset with troubles and all of that kind of thing just as much as now but there will be a solution. You'll find the way. And when you're living God's way, you will eliminate a very large percentage of all of your present troubles and fears and worries and problems, your sicknesses, your difficulties and all of those things and those that you do get into because of the sins of others. Because you must remember that all of this comes by sin and sin is the transgression of God's Law. God's Law is the perfect way, the way intended to give us everything we want and it is only because men are defying that Law, because men look on God's Law as if it's an evil thing, when it's the best thing or the one good thing God has given us. It is the right way and it is a great blessing that God has given us His Law and when we turn it into a curse, when we simply spit at it and thumb our noses at God in rebellion and disobedience, we suffer and we bring suffering on ourselves. Now, if you come out of all of that, if you begin to repent of that way of rebellion against God, if you begin to come to God through Jesus Christ, the only way you can be reconciled to Him and to have His love, His divine power and His mind and understanding put in you, you'll begin to have peace. You'll have peace within. And you'll know that you can rely on God to work out every problem and trouble. You can trust Him with the result in absolute assurance, knowing it's going to work out right. God will work it out because God does intervene. The day of miracles are not past. God does intervene in behalf of His own children if you become one of His children. I mean a begotten child and not one just because you are born of the Adam that God created. We're all His children from the creative sense in that we're His creation, but we're not all of us His children in the begotten sense in that we have actually been begotten of Him and from Him to become born as one of His children. Only a very, very infinitesimal few of the people of the earth have ever come to that place. Now, God's miracles are only for those people and they're usually done in such a way that the rest of the people cannot see it. They can't understand it and they don't believe it. But you can have it and you can have that great benefit. But listen, you'll still have to suffer because you'll suffer from the wrongdoing of others all about you. We're a part of an organized society. And we're all bound more or less to it and by it and we are affected by it and there is no way that you can get out of suffering to some extent more or less from the wrong ways, the wrong systems, the wrong cultures, the wrong practices of the people all about us in this organized society. But God will protect you, will deliver you out of every trial and trouble, will heal you when you're sick, will see that every thing works out just right and will give you every blessing if you yield yourself to Him to become His child and let Him rule your life until it's His will not yours being done. My friends, did Jesus nail God's Law to the cross? Did He ever even have power to do such a thing? Now, you've been taught and nearly all of the so-called gospels being taught today say that Jesus nailed His Father's Law to the cross. Now, to learn what gospel Jesus did preach and what He did do and what customs He did follow, we are quickly summarizing the four Gospel books of the New Testament — Matthew and Mark and Luke and John. Now, we saw that Jesus had prayed all night. And when it was day He selected twelve out of all of His disciples to become His apostles. And then He looked down upon them and He lifted up His eyes on them, His disciples that He had chosen and He said, "Blessed are ye poor..." And He was addressing this so-called Sermon on the Mount to them who were His disciples. He was addressing it to them. Now, evidently, the multitude came up while He was speaking, because when we come to the end of it, we do find that there was a crowd there. We come over here to Matthew 7 and verse 28, "It came to pass, when Jesus ended these words, the multitudes were astonished at his teaching..." So at the end of it, we do find multitudes there listening but in the beginning there is no mention of any multitudes. And Matthew says, "Seeing the multitudes, he went up into the mountain: when he had sat down, his disciples came to him." Now, He went up into the mountain at night. He prayed all night. And when it was day, apparently, by that time the disciples had come up. Luke's account shows that He prayed all night to God. And then it shows that when they came, He chose His disciples. 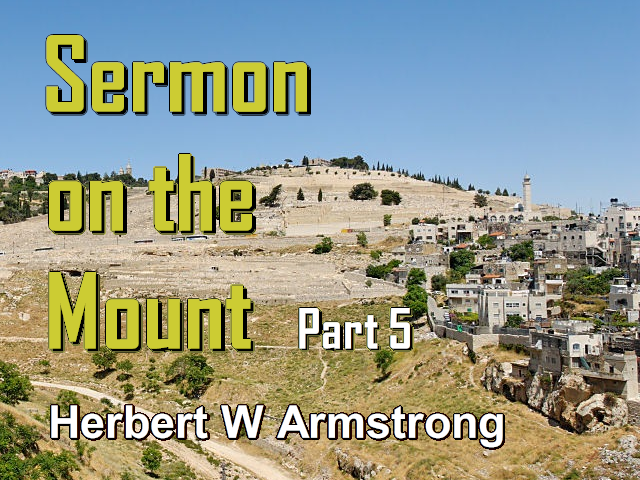 Matthew just says, "Seeing the multitudes, he went up into the mountain...", and doesn't tell what happened all night up there. But Luke's account explains that. And then Matthew says that, "when he sat down, his disciples came unto him..." That must be when He chose the Twelve, as Luke explains, because one fills in what the other omits in the Gospel accounts. "[A]nd he opened his mouth and taught them," His disciples, "saying..." And then Luke's account says, "he lifted up his eyes on his disciples," not on any multitude, "and said, Blessed are ye poor: yours is the kingdom of God....", and so on. We pick up the story thread beginning with verse 17 where Jesus said, "Think not that I am come to destroy the law..." Why do people then think He did? Now, let's see if He meant the Ten Commandments. Let's see if He was talking about it. "Think not that I am come to destroy the law, or the prophets: I come not to destroy, but to fulfill." And I explained to you what fulfill means. "...love is the fulfilling of the law." That's Romans 13:10 I believe it is. And we fulfill the Law by love. Now then, real quickly, I'd like to have you turn over into James' account for just a moment. And as we find James says in the second chapter, "If ye fulfill the royal law..." Now, Christ came to fulfill the Law, didn't He? Well, did He also come to set us an example that we should follow His steps? Peter says He did. And Jesus said to His own disciples that He had set them an example that they should do as He did. And Paul said, "Be ye followers of me, as I follow Christ." Paul followed Christ. And so we are to follow Christ. And Peter said He set us an example that we should follow His steps and He fulfilled the Law. Then we follow His steps and we fulfill it too. Now, "If ye fulfill the royal law according to the Scripture, Thou shalt love thy neighbor as thyself, ye do well...", so says James. Well now, I can hear a lot of people saying, "Well now, wait a minute there Mr. Armstrong. You see James didn't say if you keep all ten of the Ten Commandments. He just mentioned there the law, 'Thou shalt love thy neighbor as thyself...'" Now, a lot of people like to take the law — "Thou shalt love thy neighbor as thyself" — and they define it in their own human manner, in the manner that suits them best, in a vague manner, that they think they're loving their neighbor while they cheat him and while they plot against him and do everything of that sort and yet they can really believe they love their neighbor alright. It's like Will Rogers said once upon a time, "You know that there was that law thou shalt love thy neighbor as thyself." But he said, "You know we just don't all seem to be doing it." And he said, "For instance," he said, "here is a very rich man, Mr. Morgenthau", I think he mentioned or someone like that. No, he was Secretary of the Treasury at the time. But he, well, he was a rich man and he said, "Now, I might think he ought to love me enough to share all of his wealth with me." And he said, "The Communists seem to think so. But", he said, "You see, Mr. Morgenthau just doesn't seem to see it that way." And he said, "It might be that what little money I have, that other people think I ought to just give it all over to them and share it with them. That's the way I ought to love them. But", he says, "You know, I just don't quite see it that way. ", if you remember Will Rogers. And he did know a little something about human nature, didn't he? And he put it in such a manner that we usually got the point while we also got a good laugh. So, if God left us to define how we love our neighbors, we wouldn't love them. We'd just simply twist it around where we'd have a good time deceiving ourselves. But you see the trouble with that is our neighbors would be loving us that same way and we wouldn't like the way they're loving us any better than they probably would like the way we would love them. Now, does this think have anything to do with the Ten Commandments? Listen, my friends, all the Law of God is summed up in one word — love. Now, what is that love? Love is the fulfilling of the Law. And it's the love of God shed abroad in our hearts by the Holy Spirit. Not any love you were born with. That Law is spiritual, so said Paul in Romans the seventh chapter, and I think it's the 14th verse, that that "Law is spiritual..."
Now, it isn't a natural law. The laws of Physics, the laws of Chemistry, those are natural laws. The law of gravity: you can't see it, you don't know what pulls anything down to the ground or down to the floor when you let loose of it. But there's something there, something invisible you can't see that pulls it down. What is it that makes things continue to travel in the same direction in which they are already moving unless some friction or brake or something stops them and impedes the progress? We call that inertia. Well, what is it? You know I was just thinking the other day that when an earthquake comes and the whole earth under us shakes back and forth, inertia is the very law that tends to make us continue to stand still while the earth is shaking and something tends to prevent our going with it right away and the house in which we are. The first earthquake I ever experienced down here in Southern California a good many years ago before we moved our headquarters down here. And I was on the tenth floor of a Hollywood hotel at the time. And we began to notice the drapes on the windows swaying back and forth. We looked in the closet where we had some clothes hanging on coat hangers and they were swaying back and forth and we began to feel like we were wobbly and drunken and we yelled, "Earthquake!" We knew there was and earthquake. Now, what is it that shook us? Why didn't we go along with it? Well, you see inertia doesn't go along with even the earth when it moves. Inertia tends to keep you: if you're still, to hold you still, if you're moving, to keep you moving, unless some friction or something impedes you. Well, whether you see it or not, those are physical laws. But the law that regulates your happiness, your peace of mind and everything that means anything to you, as to whether you are in a happy condition or very miserable and suffering and unhappy condition, those laws that regulate those things are not visible and they are not physical, they are spiritual. Now, do you know that even many physical things that you cannot see. You don't ordinarily even see electricity unless it's flashing or something of that sort like lightning in the sky. And sometimes we see electricity jumping from one thing to another and flashing and all that sort of thing. But you don't see gravity and you don't see inertia and those are laws that are physical laws and you don't even see them, much less see the spiritual laws. Knowledge can come to the human mind naturally only through the five senses as I have said so many, many times. And things that you can see or things that you can hear... Hearing is a physical vibration. I don't understand it. I guess some of our sound engineers around here do. We're using it as I speak into this microphone. I don't know what happens. Something vibrates something in here from my voice and my voice is causing a vibration and it somehow goes through the wires and it goes out over the air and it goes from the air into your radio set and vibrates something and it causes a sound that is exactly like I am sounding here and your ears, there, all over the United States, you people in Florida, you people in Texas, you people right here in Southern California, you are hearing it, just like the few people that are here in the studio are hearing it with their own ears. I don't understand it. I presume some of the sound engineers do, but not very many of us do, but it works. Now, again, you can't see spiritual things, you can't hear them, you can't taste them, you can't smell them, you cannot feel them. Then how can you know about them? Only as God reveals them. Now, love, there is a spiritual divine love and that is the only love that fulfills God's Law. And God's whole Law is love and it's the way divine love travels. Now, human love is a different kind of love and it often travels in a different manner. Human love travels a great deal toward self and that's lust, that isn't love and that's sin and that causes you suffering. You get to feeling that you love yourself a great deal and you become full of pride and vanity and greed and you try to get everything for yourself and you try to strut and exalt yourself up above others and make a god out of yourself and all that sort of thing and you think that's going to make you happy. And you do get a rather pleasing feeling out of it for the moment but in the long run those very things are the things that are damning you soul and making you so miserable and unhappy and you don't understand why because you don't understand the working of God's divine Spiritual Law anymore than I understand the working of this sound wave deal here that carries my voice right into this microphone through all these wires and it's being recorded to go out later on other stations and I don't understand it. I don't understand how those tape machines working in there that are recording every word I am saying now just as many of you are listening to it coming over those tapes later as those wheels turn around. You can look at that tape, you can't see a thing on there and yet it is recording everything I say. It can record a great symphonic orchestra, it can record music, it can record anything. Then again it can be erased and in a split second record something else in the place of it. And you can't see anything there. It doesn't take anything off of the tape. We can run that voice or the sound through and erase it and put new sound on that same tape, I guess, a hundred times and the tape is still good if it doesn't happen to break. It finally does get old and break once in a while. Well, we don't understand these things, that's true, but we know the results and we know they work and let me tell you something, I know this — I know that most of you people and most of this world are breaking the Spiritual Law of God and you are suffering. Now, when you begin to keep the Law of God, you'll begin to have peace and happiness. Love is the fulfilling of the Law but it is the love of God shed abroad in our hearts by the Holy Spirit and that's Spiritual. And the Law is the riverbed down which that river, rivers of living water, as Jesus figuratively called His Holy Spirit, will flow. It's the channel bed and it flows out away from you and in doing good to others. Now, love, the divine love, is the principle of giving, not of getting. It's the principle of humility and exalting God and trying to serve and help others, not of exalting yourself and trying to take away from others. Now, that great Law of love is divided into the two great commandments, love toward God and love toward our neighbor. Now, a lot of people are willing to have love toward their neighbor, but they don't want any love toward God. They don't want to love God. They want to leave God out of it. Now, if you just love God the way that seems right to your mind, you don't know how to love God. And those that worship God can't worship Him the way most people think they do. They aren't really worshipping God at all because God is a Spirit and those who worship God must worship Him in spirit and in truth. Very few people know the truth, very few people have the Spirit of God and they don't have the faintest, infinitesimal idea of what it is to love God or to worship God in spirit and in truth. They want to do it in their own human way which is error and in carnality and not in truth and in the Spirit of God. You have to have the Spirit of God to do it. You know John in John's Gospel mentioned that some of us love God, but he said we only love God because He first loved us. And actually it's only a return of God's own love. That love comes from God, it flows into you and can flow back to Him and you can't have that love that toward God until His love first flows into you and you can't have that until you surrender your rebellion against God, until you put down your stubborn rebellion against the Law of God and surrender to it because sin is the transgression of that Law. And when you come to God through Jesus Christ, then the penalty of your past sins which has stood between you God is wiped out and you can be reconciled to Him. And the minute you're reconciled to Him, He stands bound by His promise to put His Spirit in you. There is no other way. And when His Spirit comes into you, that's His love, that's the divine love. And it will fulfill the Law by flowing back to God in the way that God says and out to neighbor. Now, then if God just left us to do it any old way, just to love God the way you think and love your neighbor the way you think, you still wouldn't know how. So God goes a little further and in the Ten Commandments, the first four of them, God tells you how to love God. Now, a carnal mind can't do it. A carnal mind is enmity against God, it's antagonistic toward God and it thinks God is wrong and God's Law is wrong. And you know that's what we've been doing all these years. The first man this side of the flood that set himself up as the champion of all human beings to emancipate mankind from God and from God's stern hard law was a man named...Nimrod. For a minute, I could only think of his wife's name, Semiramis. And it was a man named Nimrod. You read of him in the tenth chapter of the Book of Genesis. And Nimrod was a mighty hunter. He organized men to hunt down the wild animals before the Eternal. Before is a mistranslation, actually. Well, it's a, that is, you don't get the sense of it the way they've translated it. It means he set himself ahead of God and before God and as if he were greater and mightier than God and made himself the ruler over men. And as the Moffatt translation renders it, he was the world's first despot. Now, let's get this. I see my time will soon be up and I want you to get this. In the first four of the Ten Commandments, God tells you how to love Him. And it isn't a way a lot of people want to love Him and isn't the way they want to worship Him. You know a lot of people have idols and don't know it. Some people their idol is their home and others it's their automobile and others it's the clothes they wear and others it's money. Of course, I think more people have money as their idol than almost anything else. Some people, it might be a husband, a wife or a child. Even some people have a mother or a father complex and the mother or the father is the idol. Whatever it is, I tell you my friends, some people have had their own intellectuality as an idol and didn't realize it. And before you're ever converted, God will have to take that idol away from you and you will have to worship Him and surrender. Then again, you're not bow down to a graven image or any material thing and worship that. And God says that you must not take His name in vain because God names things what they are and there's power and meaning in a name. And God's names have meaning only we seem to have lost them. The word LORD is only a title, and is a misnomer from the original Hebrew which means the Eternal the Ever-Living. We have just lost it, that's all. And Jehovah is not the right name. And then if we love God, we'll keep holy the day He set apart and made holy and commanded us to keep. But a lot of people just don't see it that way, you know. They want their own way. They don't know how to worship God in spirit and in truth. They're not surrendered or yielded and they don't know how to love their neighbor as their self. Well now, James continues, "if you have respect of persons," breaking that law of loving your neighbor as yourself, "you commit sin and are convinced of the law as transgressors. For whosoever shall keep the whole law", that's just love to God and love to neighbor, "and yet offend in one point he is guilty of all...." That Law has points. "For he that said," or the Law that said, "Do not commit adultery, said also, Do not kill." And there He's mentioning the Ten Commandments as two of the points. "Now if thou commit no adultery," you don't break that point, "yet if thou kill," that's the one point you break, "thou art become a transgressor of the law." Well, there you are. If you'd say, "Well, I'll keep the others but I will break God's Sabbath." Well, he would say you are a "transgressor of the law".